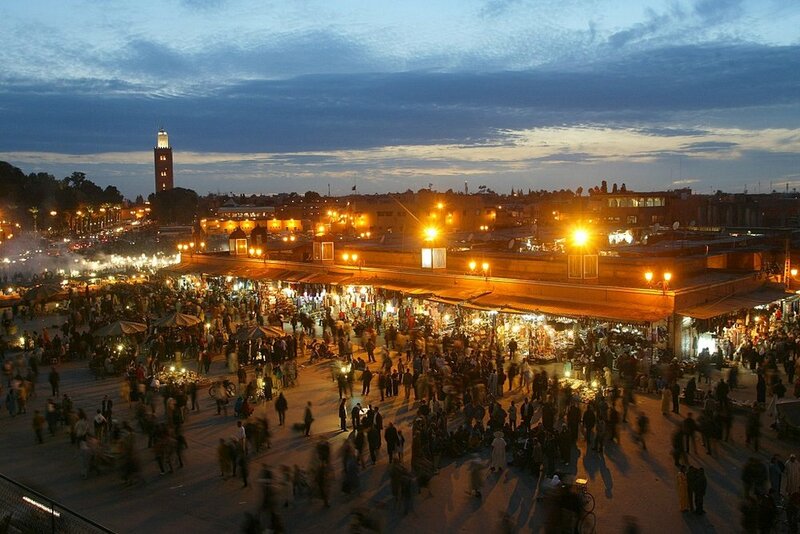 I have been going to Marrakech at least once a year for the last six years, on both personal and business trips. This being the case, I thought I would share with you some of my favourite things to do when I am there. One of the first questions I get asked about Marrakech, is about the food. Is it all camel and goat? I am vegetarian, will there be anything for me to eat? Followed by - Will I get sick? Can I wear shorts/vest tops? So, no it is not all camel and goat, although it is available if you want it. Vegetarian ? Well, so am I, so anywhere that I suggest to eat, will have some good vegetarian options, if you cannot see anything on the menu, just ask if they can make you a vegetable tagine - and reiterate the fact that you do not want any meat in it. On my visit last month, I was asked if I would like chicken with my vegetable tagine! Will you get sick ? It is no more likely in Morocco, than a number of any other countries, but do take precautions. Only drink bottled water and if eating street food, check that they do not handle the raw meat and the cooked meat with the same utensils. Shorts and vest tops. Whilst Marrakech is a great place for tourists and the people are friendly for the most part, do remember that Morocco is a Muslim country. So I would say no to hot pants, crop tops and anything you would not wear to visit your granny. You might be ok, but you are also likely to attract unwanted attention, could be harassed or possibly spat on! So keep the short shorts for by the pool. I love Morrocan food! I eat copious amounts of vegetable tagine and couscous every time I visit. Moroccan food is tasty, and they use a lot of spices, but it is spicy tasty, not spicy burn your mouth spicy. Make sense ? Western food is also available if your palate is not so adventurous, or you have overdosed on tagine... which might have happened once..
Dar Cherifa if you just fancy a break from shopping. They do good cakes too. So four of my favourite things are about food! It is not all about the food though! No really, it isn't! 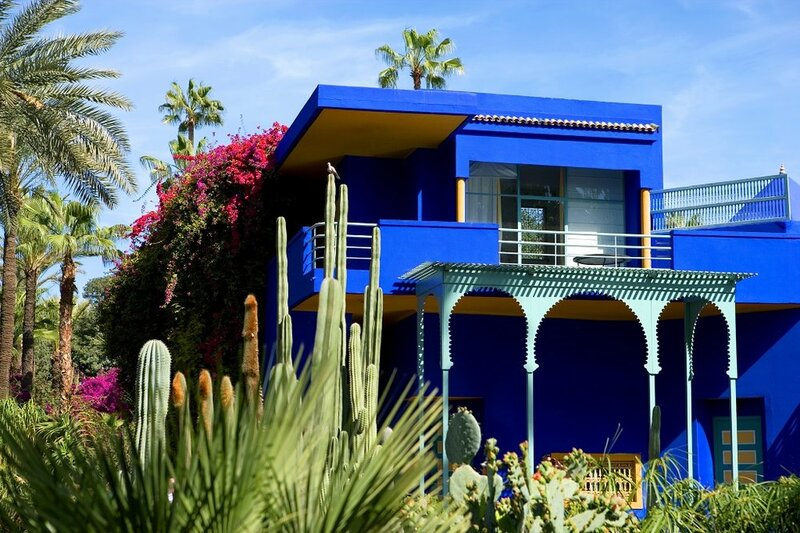 I would recommend a visit to the Majorelle Gardens, it has a wonderful selection of plants and cactii from all over the world, as well as bridges that span ponds with little turtles and beautiful colours surround you, such as the famous Majorelle blue. There is also the Yves Saint Laurent Museum which houses a number of permanent exhibitions of YSL's work as well as a variety of temporary exhitions. The Lobby Gallery is home to some original sketches and drawings by YSL himself, of costumes he made for the big screen and theatre productions. 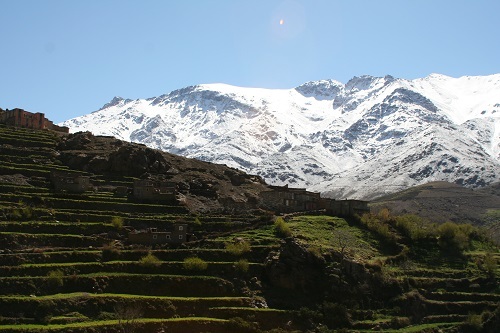 A visit to Marrakech is not complete without a visit to the Atlas Mountains and the Berber Villages. You do not have to trek, but do wear some sensible shoes/trainers and take a jacket as it is significantly cooler in the mountains. The Berber people are friendly and the village children have cheeky grins and love to pose for the camera. Plan your route back from the mountains, back via Kasbah Tamadot, where you should stop for lunch or dinner, or better still, stay for a few days. 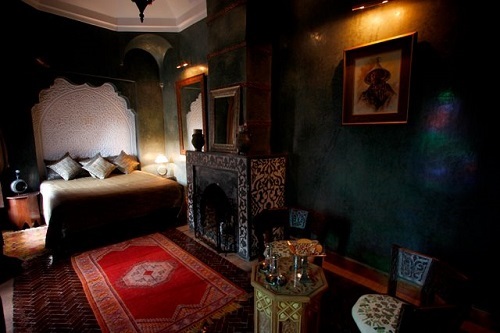 Kasbah Tamadot is absolutely my favourite place to stay in Morocco. Richard Branson employs local Berber staff, teaches them English and trains them to work in the hotel, the result is great! Wonderful Berber hospitality with the occasional joke that seems very British and all the more amusing coming from Berber. The setting is quite gorgeous, the rooms, the food, the spa, everything, if you have a chance, do stay. *Note* Children are welcome at Kasbah Tamadot at select times of the year, more details can be found on their website. Back in the city, head for Djemma El Fna in the evening, this is where it all happens. From snake charmers, and carriage rides, to local musicians and henna tattooists. The food stalls are always busy and you might give them a try, but as a vegetarian, the sight of all the animal heads was enough to put me off. Instead I love to shop for spices and with the knowledge gained from the cooking school, and a genuine tagine purchased in the souq, I can recreate the dishes at home. Lastly, no trip to Marrakech is complete without a trip to the Hammam. If you have not tried it, it goes something like this. You will then be led to a relaxation room to enjoy some traditional Moroccan mint tea and marvel at the fact that your skin has probably never felt so soft, or clean! Note* - You may find yourself stroking your arms in public, it cannot be helped, your skin is soooo soft, but try to keep it for when you are back in your riad or hotel, or you will get some funny looks. I hope you enjoy Marrakech as much as I do.